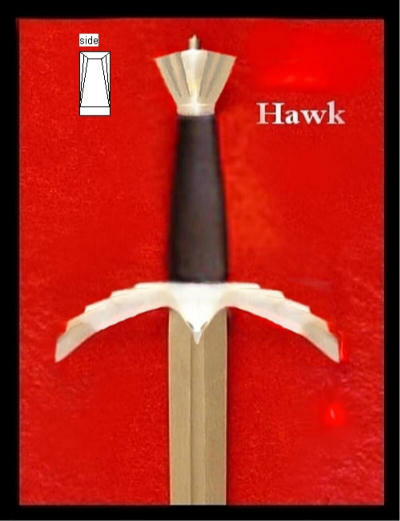 I had this idea for a custom hilt design of a Hawk, let me know what you think of it. Clever! There is a nice consistency to it. Might be a few sharp bits to snag on, but overall the parts turn away from the hand, which I tend to prefer. I assume it would be a pair of birds (i.e. head on each side)? There would be real possibilites for someone good (e.g. Mr Stevenson) to go wild on the feather detail. I was more thinking Art Deco style to keep it simple and strait lined no details just the necessary lines to make out the shap of the hawk. I like that Art Deco look. And yes the Hawk design on each side. Yes, definitely Art Deco as it stands. There's a pair of green glass vases on my bedroom shelf that could be the model for the pommel. I guess I'm more into the 'naturalistic' (a confessed birdwatcher). I like the way you've 'wedged' the tail end to make the pommel nut less obtrusive. Neat.